PISA seeks to measure how well young adults at age 15 (and, therefore, near the end of compulsory schooling in most participating education systems) are prepared to use their knowledge and skills in particular areas to meet real-life challenges. PISA’s orientation reflects a change in the goals and objectives of curricula, which increasingly address how well students are able to apply what they learn at school. 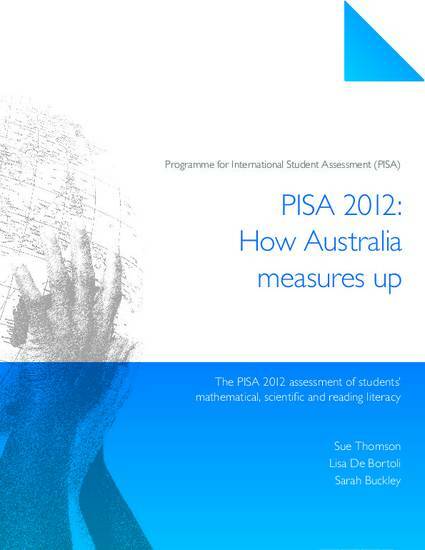 This report presents the results of the PISA 2012 assessment for Australia. It presents the results for Australia as a whole, for the Australian jurisdictions and (where relevant) for the other participants in the study, so that Australia’s results can be viewed in an international context.